Hope your 2011 is off to a fantastic start. I alternately cannot believe that the week is going by so slowly and yet we're already into the 7th day of January. 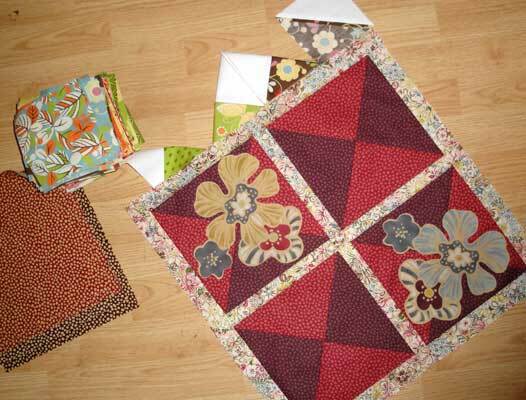 I made hour-glass blocks just for fun and thought it would also be fun to applique the flower motif from other fabric squares in the layer cake. Don't know what this will eventually end up looking like, but in the meantime I'm auditioning different fabric choices from my stash and alternately thinking of potential block combinations to grow the quilt. Ideally the finished quilt will use up all the rest of the layer cake which is mostly wonky polka dots in muted browns, tans, and reds and a few coordinating florals.